Back in the 1940's and 1950's the major studios cranked out dozens of movies every year. One of the big genres that was a constant moneymaker was the Western. For every major Western release there were probably another five that would see release without much fanfare. Some of them were legitimately B Movies, but some were just programmers - assemblyline product to place in the theaters to sell tickets. The thing was, though, that assemblyline produced a lot of good movies, most of which have been largely forgotten in the decades since. One such movie is Denver & Rio Grande, starring the great Edmond O'Brien and directed by War Of The Worlds director, Byron Haskin. O'Brien was always good. In fact, his worst performances were good, and his best were outstanding. He was a great movie actor. He had presence, and he had charisma. He was also just a little pudgy in his leading man days, but that small amount of extra weight lent itself to realism. He wasn't just a pretty-boy or an unrealistically handsome leading man, he was truly an everyman. In Denver & Rio Grande O'Brien plays Jim Vesser, a railroad construction team manager who finds himself in conflict with a rival railroad's construction team, led by an unethical and ruthless pair, Sterling Hayden as McCabe, and Lyle Bettger as the unfortunately named Johnny Buff. McCabe has a history of using violence to push out rival railroad groups in order to complete the track on the route selected by his employer. He'll use any means necessary to get his track completed, even if it means that people working for the other railroad are killed in various, "Accidents." In a fistfight with an old Army buddy, Bob Nelson, and McCabe (two against one), Vesser is the victim of a frame job as McCabe shoots Nelson and Buff (an eyewitness) blames Vesser. Vesser had been hit in the head and was woozy, so he can't remember exactly what happened and believes that he may have done it. While he is cleared in court of the shooting (accidental per the court, although no one knows that McCabe actually did the shooting - and intentionally at that), Vesser blames himself for his friend's death and quits the job. 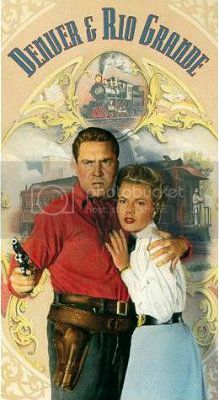 McCabe and Buff take advantage of Vesser's absence and cause a string of accidents through their sabotge, leading to the death of a railroad engineer. Vesser, now aware of the troubles comes back to work for the Denver & Rio Grande company, and it's a battle to the finish to see which company will get to use the better route for their track. There are gunfights, fistfights, bar room brawls, and trainwrecks in Denver & Rio Grande, so there is no shortage of action on screen. But amid all the chaos is a pretty strong plot and some pretty well written characters. And some good actors to bring those characters to life (Sterling Hayden, often a block of wood, is quite effective here, as is Lyle Bettger, Dean Jagger, J. Carroll Naish, and Laura Elliot (who later went by her real name, Kasey Rogers). O'Brien, as usual, chews the scenery with style and flair. He makes the movie work. 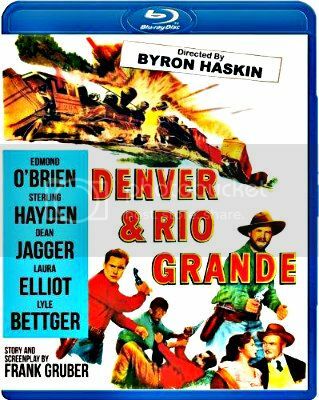 Without the right leading man Denver & Rio Grande would have been an average Western at best, with O'Brien, however, the movie is elevated to an above average Western, and a very entertaining one at that. Olive Films has been licensing movies from Paramount for the last year, and they have done a fine job with them. No, there are no extras on the discs for the most part (none on this one), but the mastering/encoding jobs they have done have been solid. The prints are not restored, but they look as good as possible short of an expensive restoration, and most of these titles - like Denver & Rio Grande - would have never seen release on DVD or Blu Ray had it not been for Olive. This one is well worth buying if you are a fan of Westerns. A rental at the very least. Good stuff for sure.